I have been very fortunate to have some free time lately to be able to spend time reading. There is something that is so relaxing about reading. Now that the kids are back to school, I am able to find time to read in the evening. 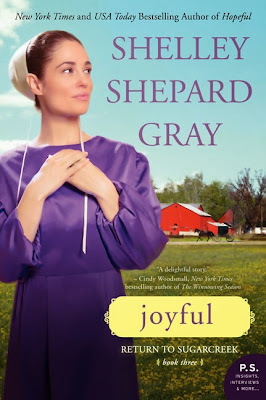 Most recently, I finished reading Joyful by Shelley Shepard Gray. This is the third book in her Return to Sugarcreek Series. As with the last book, it was nice to be able not only to explore the story of the two main characters, Randall Beiler and Elizabeth Nolt, but also to spend some time catching up with Judith and Ben and their foster child James and the other characters that were included in the first two books. But don't worry, there is no requirement to have read the first two to be able to enjoy this story. There is something so appealing about the characters that Gray develops. As I read the book, I couldn't help but feel a connection to them, to want to influence the situations in their favor. The strength of the bonds that they share with their family is something that I admire. Having come from a large extended family, I love spending time with family and love to see that in the book. The themes of love, loss, self discovery, and celebration are universal, the fact that the characters are Amish seemed to be more of a backdrop or setting for the story than something that was a focus. If you enjoy a good romance, then you will enjoy this book. Find more reviews and info here.